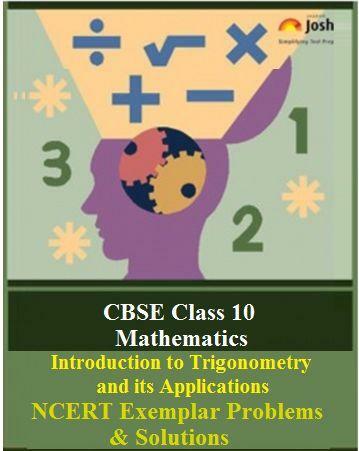 Here you get the NCERT Exemplar Problems and Solutions (Part-IVA) for CBSE Class 10 Maths chapter 8, Introduction to Trigonometry and its Applications. This part brings you the solutions to Q. No. 6-12 of exercise 8.4 of NCERT Exemplar for Mathematics chapter 8. Check out these solution for stepwise clear and easy explanation. Here you get the CBSE Class 10 Mathematics chapter 8, Introduction to Trigonometry and its Applications: NCERT Exemplar Problems and Solutions (Part-IVB). This part includes solutions of Question Number 7 to 12 from Exercise 8.4 of NCERT Exemplar Problems for Class 10 Mathematics Chapter: Introduction to Trigonometry and its Applications. This exercise comprises only the Long Answer Type Questions framed from various important topics in the chapter. Each question is provided with a detailed solution. Question. 7 The shadow of a tower standing on a level plane is found to be 50m longer when Sun's elevation is 30° than when it is 60°. Find the height of the tower. Let AC be the tower of height h and 60° and 30° be its angles of elevation at distances x m and (x + 50) m, respectively as shown below. Question. 10 If sinθ + cosθ = p and secθ + cosecθ = q, then prove that q(p2 -l) = 2p.